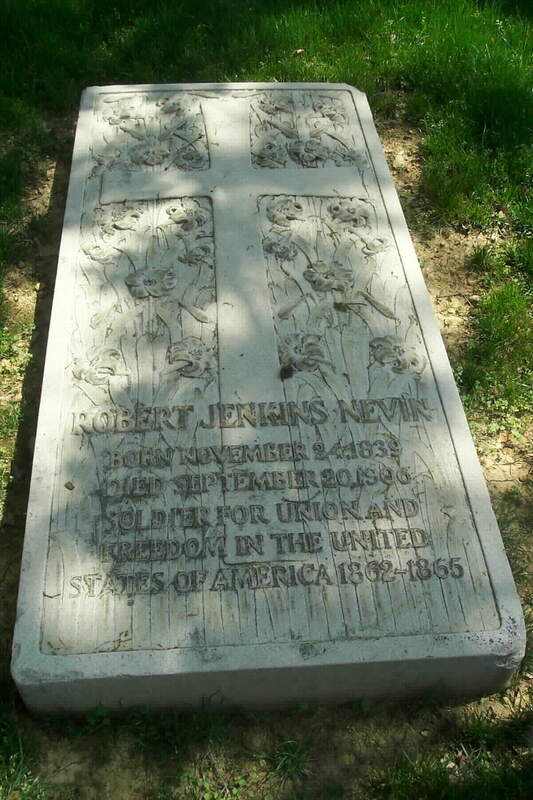 Robert Jenkins Nevin was born 24 November 1839 at Allegheny City, Allegheny County, Pennsylvania, the son of John Williamson Nevin and Martha Jenkins Nevin. He was educated in Theology at the Divinity School, Philadelphia, Pennsylvania. He continued his education at the General Theological Seminary, New York, New York and at Franklin and Marshall College. He received his D.D. in 1874 from the Union Theological Seminary, Pennsylvania, and an L.L.D. in 1887 at Hobart College. He graduated from Franklin and Marshall College with "highest honors" and delivered the Marshall Oration on "Chief Justice Marshall." On 11 August 1862, he was commissioned a Second Lieutenant, Company C, 122nd Pennsylvania Volunteer Infantry. He was subsequently promoted to First Lieutenant and as mustered out of the volunteer service with the Company. Later in the Civil War he commanded Independent Battery I of the Pennsylvania Volunteers. (Captain Robert J. Nevin's Battery). 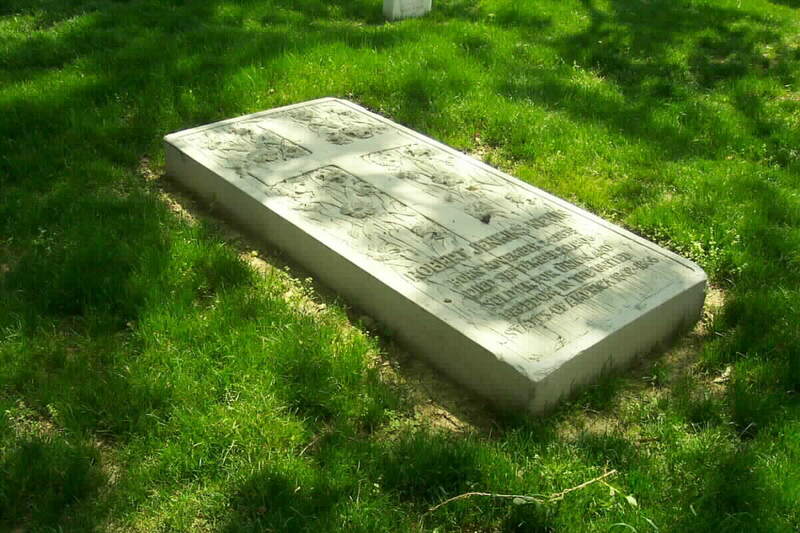 He was breveted Major, and commanded the Central Brigade in the defenses of Washington, D.C.
From 1868 until his death in 1906, he was employed as a Priest at various locations, including Rome, Italy. He was ordained to the priesthood in 1867 at West Chester, Chester County, Pennsylvania, and served at the Church of the Nativity until October 1869, when he took charge of "St. Paul's Within the Walls" in Rome, Italy. John Dennison Nevin writes: "Robert Jenkins Nevin took charge of 'St. Paul's Within the Walls', Rome, where he served for 37 years. He obtained funds for the present building, begun in 1870 and finished 1876. This was the first Protestant church in Rome. Considerable international diplomacy was necessary before the Vatican gave its consent to the building of this church, and even then, Dr.Nevin's life was in danger from religious fanatics. This Gothic structure is much admired; its chief attraction for art lovers is in the mosaic designed by Sir Edward Burne-Jones. Dr. Nevin was commissary for Bishop Potter in starting the Cathedral of St. John the Divine in New York, and selected the present site for that building." The 125-year-old Church of St. Paul's-within-the-Walls, the first non-Catholic church built inside the ancient Roman walls. In a challenge to papal authority, the first rector of St. Paul's, the Rev. Robert Jenkins Nevin, who had served as a Union artillery major in the Civil War, ordered the builders to make the church's bell tower tall enough to be seen at the Vatican. The American Episcopalian church was built 1872-1876, by George Edmund Street. The architect was commissioned by the Episcopalian pastor Robert J. Nevin. It was the first permanent church built in Rome by a non-Catholic community. Above the entrance is a mosaic by George Breck, made in 1909, depicting St Paul at Prayer. Above that is a rose window with symbols of the Evangelists. On 2 December 1960, the church was visited by Blessed Pope John XXIII together with the Anglican Archbishop of Canterbury, Geoffrey Fischer. An inscription by the door commemorates this. The door was installed in 1977, replacing the original one. The nave has three aisles. In the presbytery are mosaics from the late 19th and early 20th century in Byzantine style. The apse mosaic depicts a scene from the Apocalypse of John, and was made by Sir Edward Burne-Jones. There is an official website of St Paul's within the Walls: www.stpaulsrome.it. 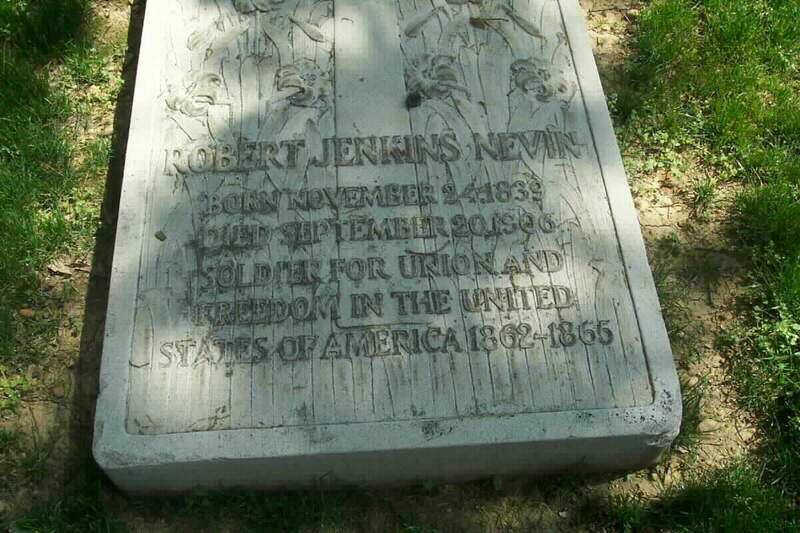 Nevin died on 20 September 1906 and was subsequently buried with military honors in Section 3 of Arlington National Cemetery, beneath a stone which reads: "A soldier for the union and freedom in the United States of America, 1862-65." Independent Battery I, Pennsylvania Volunteer Light Artillery "Nevin's Battery"
Organized at Philadelphia and Harrisburg December 31, 1863, to January 7, 1864. Attached to Camp Barry, 22nd Corps, Department of Washington, to May, 1864. 2nd Brigade, DeRussy's Division, 22nd Corps, to July, 1864. 3rd Brigade, DeRussy's Division, to December, 1864. 1st Brigade, DeRussy's Division, to June, 1865. Garrison duty in Defenses of Washington south of the Potomac entire term. Mustered out June 23, 1865.